Friday night I worked on an ornament. Sunday I didn't end up going to the parade, I decided to stay home and stitch. During the weekend I did manage to finish the ornament I was working on, but can't share it yet. I need to finish finish it and have in the mail by the 10th of December. Instead of working on Dragon, I decided to start another small on Sunday. 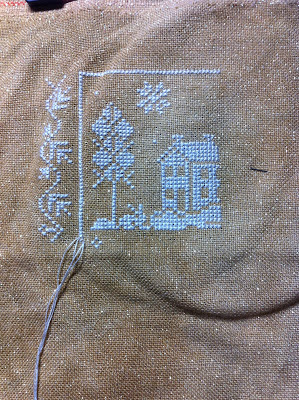 I wanted something easy to stitch while I watched some movies on netflix. I also worked on it last night. This I can actually share! That's a great start Bonnie. Love the fabric. That's working up pretty quicky!!!! Ooooh, Snow White! I did that one too, and love it! It's on display all of January in my house.